Pictures from top to bottom: Weingut der Stadt Frankfurt in Hochheim, Frankfurt City Town Hall - Roemer - with Weinstube im Roemer, Frankfurt and its Banks, Christian G.E. Schiller in the Weinstube im Roemer in 2010. That the city of Frankfurt is in the winemaking business goes back to the secularization (the expropriation of the church and transfer of the assets to the state)that took place under Napoleon at the beginning of the 1800s. In the course of the secularization, the city of Frankfurt became the owner of the Carmelite Monastery, which had existed right in the middle of Frankfurt since 1246. With the monastery came its winery and vineyards. The Weingut der Stadt Frankfurt was borne (in 1803). For almost 200 years then, the Weingut der Stadt Frankfurt was a government owned and run winery. During the privatization wave that swept through the world in the 1980s and 1990s, in 1994, the city of Frankfurt decided to privatize the operational side of the Weingut der Stadt Frankfurt and signed a 30 years lease with Armin Rupp, a winemaker from the Pfalz. The Weingut der Stadt Frankfurt is based in Hochheim in the Rheingau. You can reach it easily via S-Bahn from the Frankfurt Central Railway Station within 30 minutes. 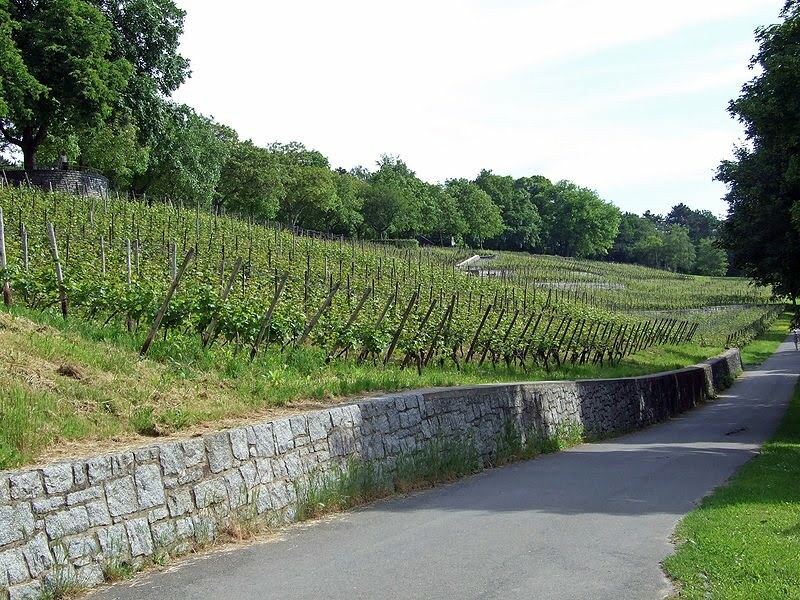 The 24 hectares of vineyard area include land in Hochheim’s top sites Domdechaney and Kirchenstück. Mainly Riesling is planted there, but also Weißburgunder, Spätburgunder, Chardonnay and Cabernet Sauvignon. The production is around 200.000 bottles per year. Picture: Lohrbeger Hang Vineyard in Frankfurt (above) and Weingut der Stadt Frankfurt in Hochheim (below). In addition, the Weingut der Stadt Frankurt owns 1.3 hectares of land within the Frankfurt city borders, on the Lohrberger Hang. This vineyard exists since 1900 and is a bit of a curiosity. It is the most eastern vineyard of the Rheingau and detached from the rest of the region. You can drink the wines of the Weingut der Stadt Frankfurt all year round in the Weinstube im Roemer - the historic Frankfurt town hall. The Weinstube im Roemer is a nice wine tavern which offers good, hearty food from the Frankfurt area, such as Handkaes mit Musik, Fleischwurst mit Brot and Rippchen mit Kraut. The Weinstube im Roemer only serves wines from the Weingut der Stadt Frankfurt. If you want to buy the wine, the Weingut der Stadt Frankfurt has a sales office, also in the Frankfurt City Town Hall, just a few meters away from the Weinstube im Roemer. The sales office is open Monday to Friday in the morning. The wine portfolio of the Weingut der Stadt Frankfurt is quite large, with 55 different wines on the list. At the time of the posting Euro 1 equaled US$ 1.46. First, there are 6 entry-level wines in the liter bottle, mostly dry, but some also off dry and sweet, in the Euro 3.80 to 4.30 range. Second, the 14 dry wines range from Kabinett trocken to Auslese trocken and include a 2009 Frankfurter Lorberger Hang, Riesling Spaetlese, trocken. They range between Euro 4.30 and 8.60. Third, 7 off-dry wines are on the list with an interesting 2009 Hochheimer Reichestal Gewuerztraminer Spaetlese halbtrocken for Euro 5.80. Fourth, the 9 sweet wines cover the whole spectrum from a sweet Kabinett to noble-sweet Beerenauslese and Trockenbeerenauslese. The star on the list is without doubt the 1976 Hochheimer Kirchenstueck Riesling Trockenbeerenauslese for Euro 82.40. Fifth, the sparklers are made both in the tank and the traditional bottle (second) fermentation method, from brut to halbtrocken, both Riesling and Pinot Noir based. They are all non-vintage Sekts. The Hochheimer Stein Riesling brut costs Euro 8.30. Sixth, in line with the German red wine revolution, Weingut der Stadt Frankfurt offers 10 red and rose wines, mostly around Euro 5. Two wines aged in barrique stand out, including the 2007 Hochheimer Stilweg Cabernet Sauvignon for Euro 11.80.